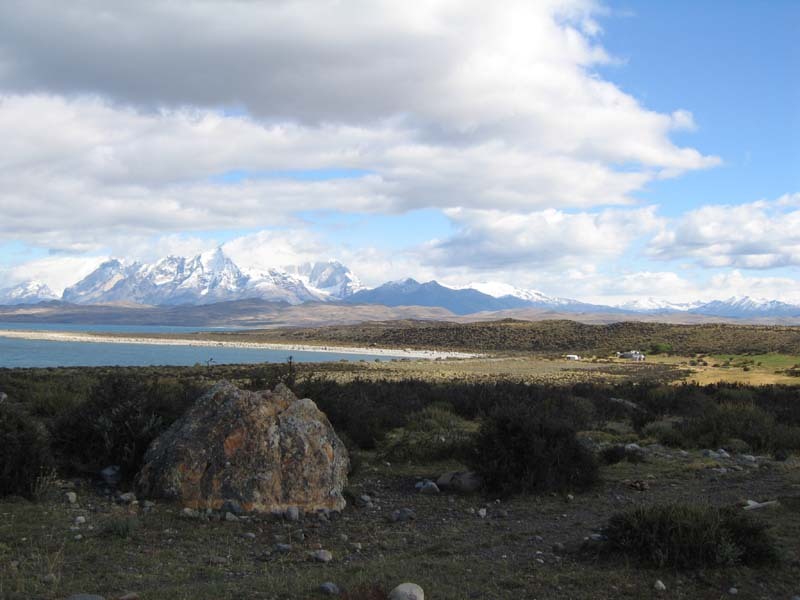 Most people, when they think of Patagonia, think of glaciers, penguins, and the literal end of the world. Some might call to mind the Straights of Magellan, Igazú Falls, and Tierra del Fuego. But…I can just about bet my life on this fact…hardly anybody thinks of wine. That was true for me, as well, right up until yesterday. Now, when I think of Patagonia, I think of Malbec, Pinot Noir, a delightful Sauvignon/Semillon and a rich Cabernet. Strange as it may seem to inhabitants of the Northern Hemisphere, there are vineyards in Patagonia, and since the late 1990’s, fine wine has been produced by a winery called “Bodega del Fin del Mundo.” The name, naturally, translates to “The Winery at the End of the World”. A few days ago I was lucky enough to taste through a wide range of the wines of the Bodega del Fin del Mundo, and while I enjoyed them all, I’ll keep this review short by concentrating on my favorite: The Postales del Fin del Mundo Malbec 2008, made from grapes grown in, of all places, Patagonia, Argentina. My tasting notes are, like my mindset today, rather jumbled, so I’ll just leave them that way. 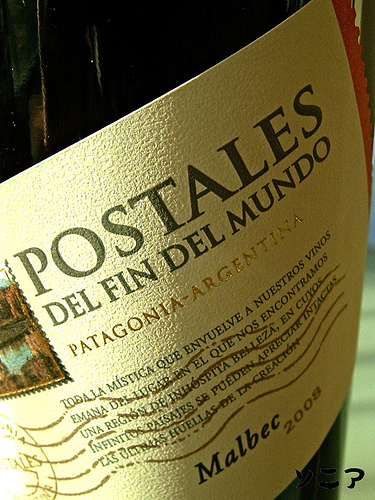 This wine, Postales del Fin del Mundo Malbec 2003, has a beautiful ruby-black-red color, highly perfumed aromas of black currant, plum jam, raspberry, and a teeny-tiny waft of vanilla-scented oak. This is a beautiful, fruit-forward, well-proportioned wine….I’m tempted to say that it’s like a Greek statue…muscular and powerful but not bulky. This could easily be a burgers, pizza, or steak-on-the-grill partner, and at a retail price of around ten dollars the price is right. However…this wine could take it up a notch, so why not give the kitchen a whirl and serve this wine with pork tenderloin medallions topped with roasted red bell pepper-tomato butter served on a bed of mashed sweet potatoes and a side of spinach lightly tossed in garlic and butter??? Put out that kind of a meal and you’re going to be getting a lot more of what you want in life. Geographically speaking, the vineyards that grow these lovely grapes are located in San Patricia del Chañar, which is about 500 miles south of the more famous vineyards of Mendoza, and approximately 1100 miles north of the frozen tundra of Tierra del Fuego. This remarkable viticultural project began in the 1990’s with the building of over 12 miles of irrigation channels intended to capture the waters of the River Neuquén, which itself is fed by snow melting off the majestic Andes. This region is essentially a dessert, and like many desserts, is often assaulted by high, steady winds- so much so that windbreaks were constructed to surround and protect the vineyards. However, the region boasts just the type of rocky soil, significant temperature extremes, and low humidity that vitis vinifera thrives in, and the area has been compared – terroir-wise- to Bordeaux, Asti, and Mendocino. Perhaps the validity of such comparisons are yet to be seen, but I, for one, always knew there was something good to be found at the end of the world.